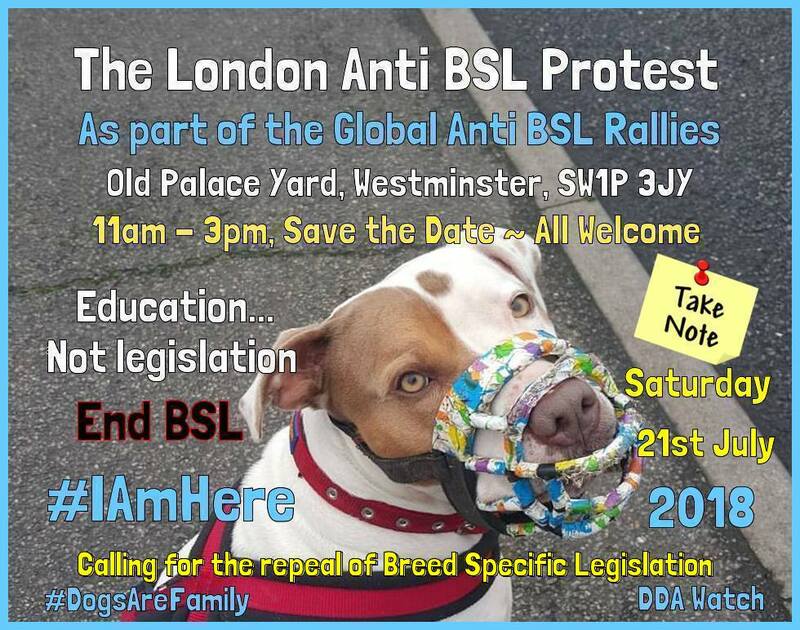 A London Rally calling for the repeal of Breed Specific Legislation will take place this Saturday (21 July) outside Westminster, as part of the annual Global Anti-BSL Protests. Breed Specific Legislation was introduced to the UK in 1991 with the aim of reducing dog attacks but has resulted in the suffering of countless dogs based on their appearance. The peaceful protest, organised by DDA Watch Ltd, will take place at Old Palace Yard, Westminster, SW1P 3JY at 11am to 3pm, with similar awareness events taking place in Ottawa, Canada, Germany, Ontario, Canada and Cardiff, Wales. A government inquiry is currently taking place on the issue of dangerous dogs and BSL, with organisations submitting overwhelming evidence to the EFRA Committee in support of the repeal. This includes heart-breaking cases of friendly dogs deemed as a ‘type’ being put to sleep due to the legislation.